The VYS Board of Directors is very pleased to share with its membership its 3 year strategic plan – VYS 2020. The plan provides clear objectives and goals on where the Club is headed over the next few years and how we are going to get there. We hope the plan ensures the most effective use of our organization’s resources by focusing on key priorities and informs our membership on the Club’s plans through 2020. The Club is strong across many metrics but desires to be even better. 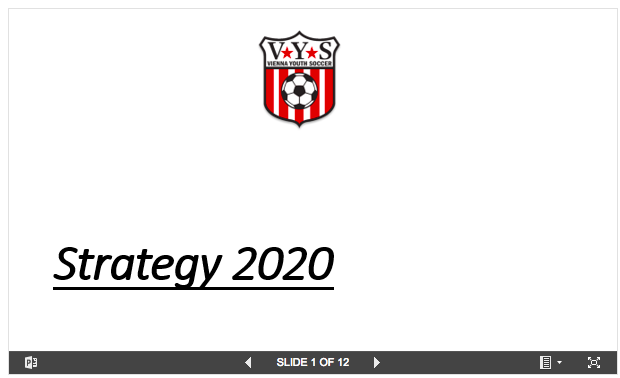 We hope you will join us on this exciting journey of making VYS 2020 a reality and Vienna Youth Soccer better than ever.